Hello! Thanks for visiting me. I'm under construction, so please pardon any incomplete features, dead links, broken images, and general idiocy encountered while navigating my corner of the interwebs. This page, "Home" is about me and my house. I'm an early 30's jack-of-all-trades - I play several instruments, run a retail store during the day, repair and modify cars and motorcycles in my spare time, and am working hard on fixing and upgrading my house while I'm at it! I hope that this page (and all of it's content) is helpful to others. I plan on expanding each page in the near future into it's own subdomain so that I can build up a large base of content, which will also allow me to keep pictures and links better organized. You'll find images and information about all of my automotive and motorcycle related content across the top in the header - if specific information isn't available, you can ask, though most of the questions you're likely to have have been answered before on one of the various forums I'm a member of. Update: 05/10/2015 - Paint and DESTRUCTION! This past weekend I spent a lot of time cleaning and painting in the kitchen. Is it done? No, but it looks a heck of a lot better than what was there before! 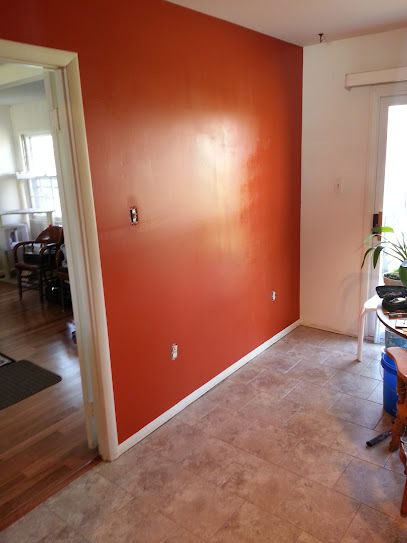 We chose a really nice Orange from Valspar - they call it "Crimson Glow". I only snapped a few quick pictures, but I'll add more later. Baseboards still need to be painted, and then cut and install new quarter-round, and the back half of the kitchen will be done! Don't worry, I promise that the Orange is a LOT smoother once it's dried - I love this color! However, I promised you paint and destruction, so here's a quick placeholder for the destruction! The family room had 3 beams that ran across the ceiling. They didn't do anything at all - just broke up the ceiling and cast dumb shadows that made the room look a lot smaller and claustrophobic. My Dad & I guessed how they were installed, but we were wrong! 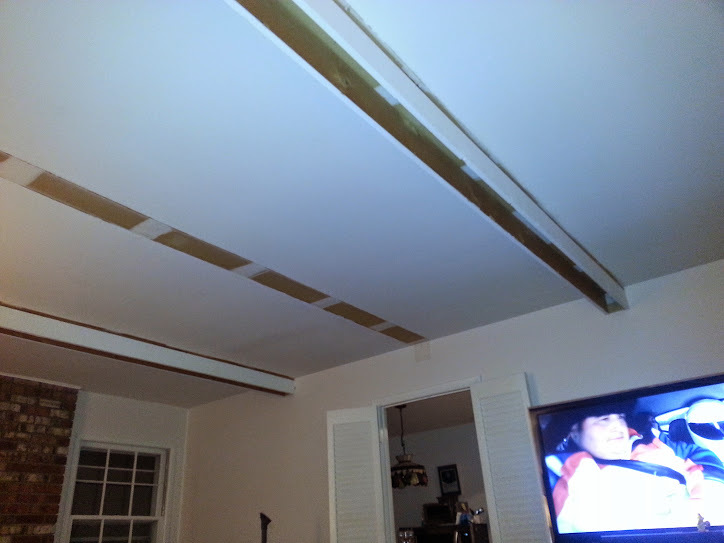 We figured a 1x4" header board was installed along the ceiling, and then the 1x6" verical boards were nailed to that. Instead, the builder simply put the boards up against the ceiling, and toenailed them into place. To make extra sure that they didn't go anywhere, he also had his crews put nails from two different directions into the walls, which made getting the boards out a real horrorshow. I ended up having to cut upwards with a reciprocating saw in the middle of the beam, then prying each beam gently downwards, and go along cutting the nails with a big pair of wire cutters to prevent the nails (installed at an angle, obviously) from ripping out large chunks of ceiling. Forgive the rather large person on TV - I had on Top Gear while working, and they did a challenge to prove how big an impact vehicle weight had on acceleration and stopping distance. In this picture, I have the bottom boards removed from the two outer beams in the room. The beam on the far side of the room proved particularly difficult, and actually ended up making a pretty big hole in the wall (about 4x6") when I removed it. I don't have pictures of the big hole, but it's been patched and mostly spackled since then, I'm getting ready to finish up the ceiling and paint! 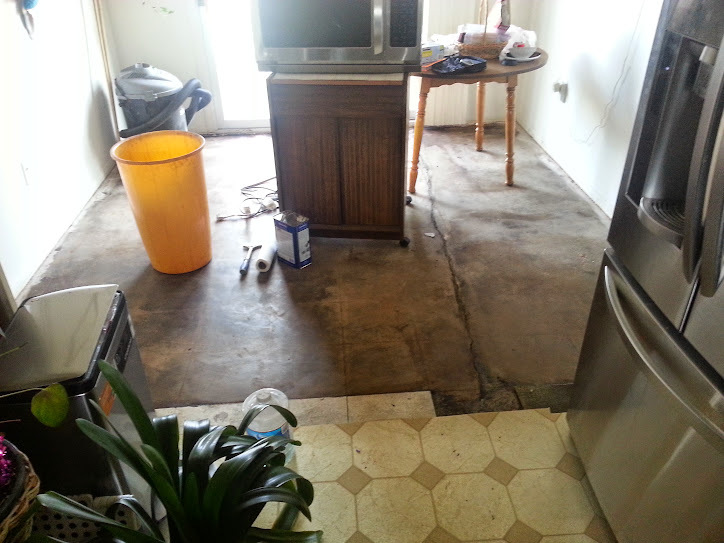 03/15/2015 to 04/03/2015 - Everything and the Kitchen...Floor? So in our ongoing process of remodeling our home (which is a lot harder once you've lived in it for a few years instead of doing it when you have a fresh move in! ), we're working from one end of the house, and moving towards the middle. Then, we'll start at the other end (bedrooms) and work towards the middle, and finish the Living Room/Dining Room last. Well, after the Family Room, that meant the kitchen is up next. 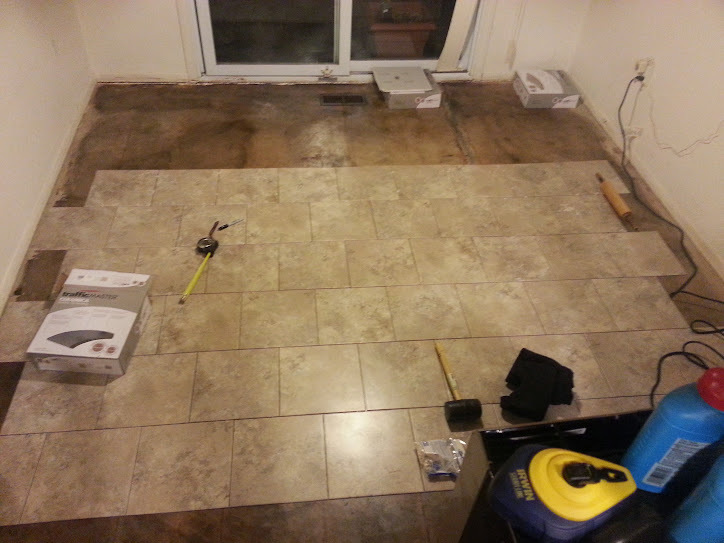 The first thing we decided on was that the flooring absolutely had to go. 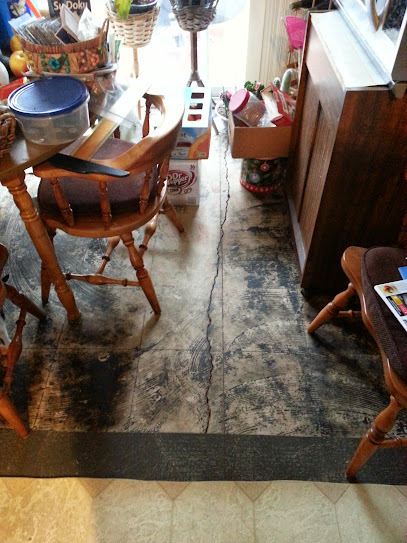 It was a gross linoleum sheet flooring that was peeling up at the back edge, and severely faded & scratched throughout. 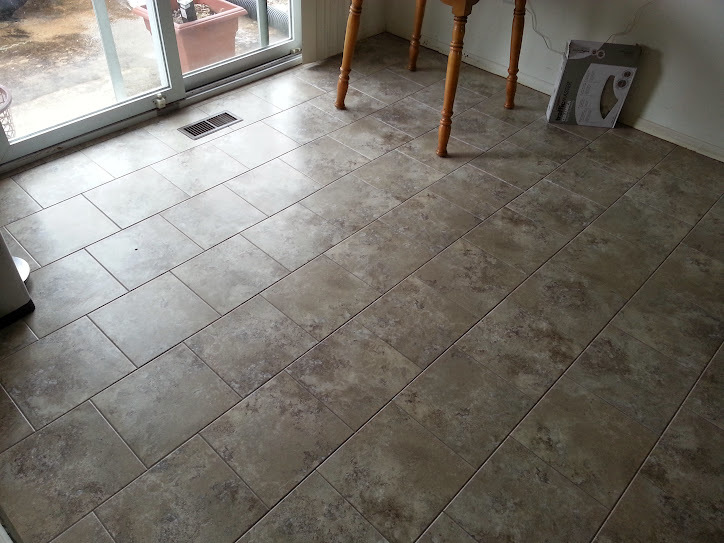 We discussed options - having it redone with the same flooring used in the family room (too expensive), having it done with ceramic tile (too cold & hard), and lastly, me redoing it with vinyl tile. Inexpensive, easy to clean, not frigid to the touch in wintertime, and available in a bunch of really nice colors and patterns. So, we went and found a tile in the "Cool Grey" pattern at Home Depot, and picked up a few boxes of it. 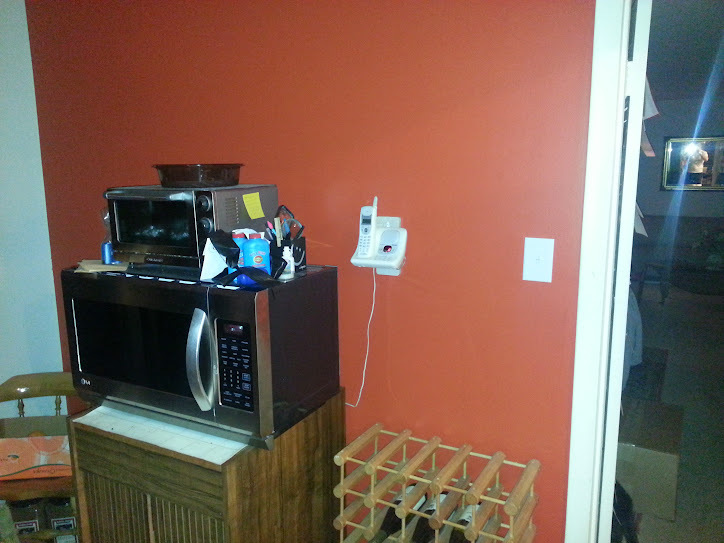 Originally, we had planned to do the laundry room first, but that's going to wait a bit until everything else is done. 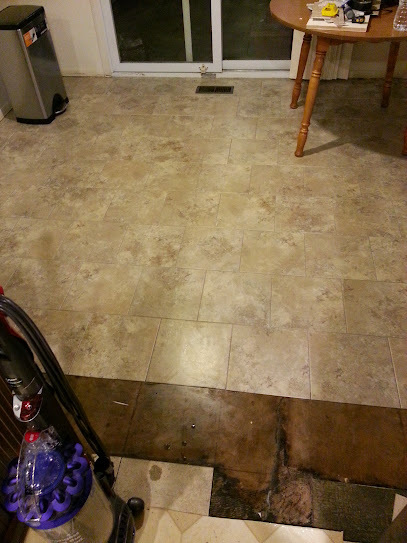 In the bottom of these pictures, you can see the sheet linoleum flooring, and how dirty it was. 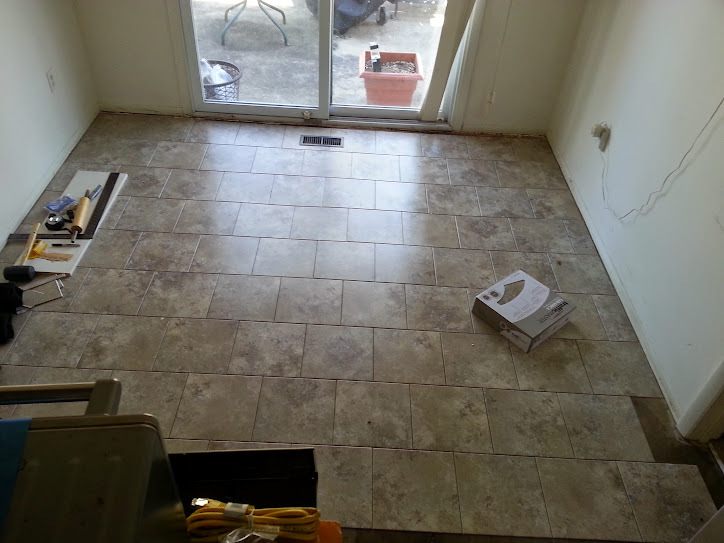 Underneath the sheet flooring, you can see there was linoleum/vinyl tile! Pulling all of that up (the sheet flooring in sections, then the tiles piece by piece), revealed that there's a really weird black adhesive stuck to the slab. After doing some research, I found out that stuff is called "Asphaltic Cutback Adhesive" for reasons that I haven't bothered to learn. What I did find out is that sometimes it contains asbestos - potentially a dealbreaker for me doing this myself. I talked with a neighbor who recently had his house renovated, and he said the contractors had the flooring and adhesive tested for asbestos, and both came back negative! We're in luck! Unfortunately, I didn't know how to remove this stuff, and every floor primer ever invented specifically says "Do not use this product over Cutback Adhesive." The internet says "hire a professional". Darn. I tried a putty knife, which failed miserably. Then, I tried a putty knife with the magical juice of Xylol/Xylene solvent. It kinda worked, but took a long time and left a lot of residue (you can see it on the right hand picture). Luckily, I'm friends with a guy who runs a carpet and flooring store, and he recommended a 4" razor scraper, commonly available at lowes. I started scraping, and the stuff came off the slab remarkably well! Then, I went back over section by section with the scraper and the xylol, and it came off beautifully! 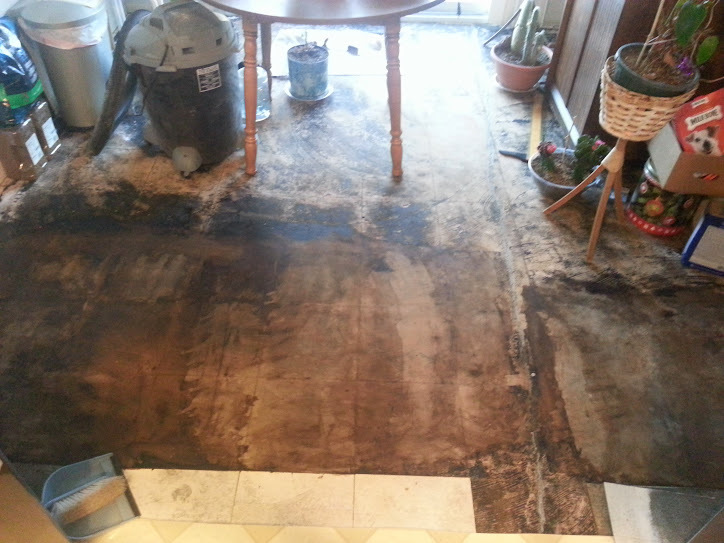 On the left you can see the back half of the kitchen cleaned and scraped. 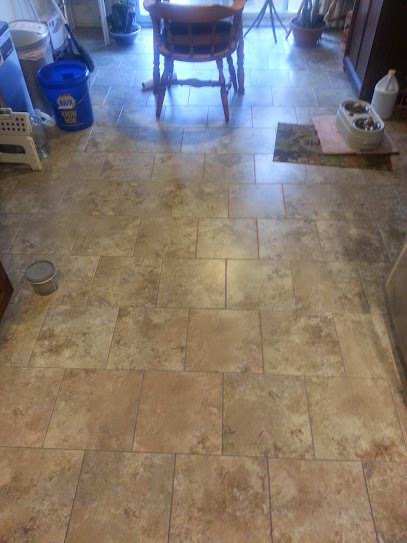 I did the whole back half (cleaning & installing the new tile) on the back half before I started the front, but I wanted to put both "clean" pictures at the same time so you can see the detail of what the old/dirty looked like before the primer can go down. The narrow crack in the slab was filled with a concrete epoxy mix that's made to fill and seal. I used a roll-on primer that came out of the jug in a milky white color. As you spread it, it made purple bubbles, which I thought was pretty cool. As it dried, it went purplish/clear, and left the concrete slightly wet looking. The tile I bought was peel and stick, which was nice because I didn't have to mess with any thinset, mortar, or roll-on glue. Plus, you can walk on the primer without causing damage - just keep it clean and it'll be ok! You can see the beginning of laying down the tiles! Use a chalk line to snap an even straight line on the floor, set your first tile with one edge right up against the chalk. Use 1/8" Tile Spacers (you'll only need 6 to do the entire floor - as soon as the glue touches the floor, it's pretty much stuck for good. Use a rubber mallet (or dead blow hammer) to seat them, then a rolling pin to make sure the edges get permanently stuck to the floor. I offset each row of tiles 6" to the right (half a tile) to get a cool offset/staggered pattern rather than a grid look. 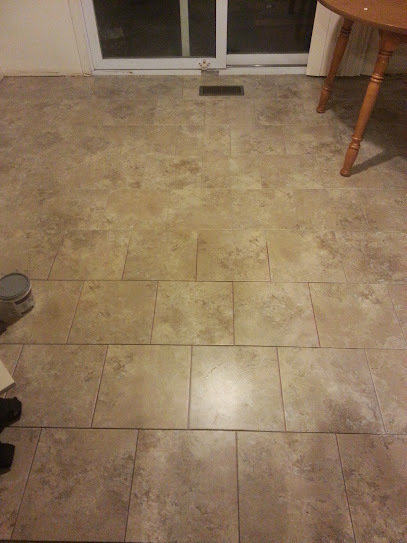 For that, I used a measuring tape and a fine tip sharpie - go 6" to the side of the tile, and make a tiny mark on the floor. Then, use 2 of the spacers up against the previous row, and align the corner with the mark on the floor. For consequent tiles, use two spacers on each side to ensure that they go down square & straight. When you need to cut the tiles for the edges, use a sharp razorblade with a metal straightedge on top of a piece of plywood. A few passes with the knife, and the tile will be scored deep enough that you can bend it gently and it'll basically snap along the line. 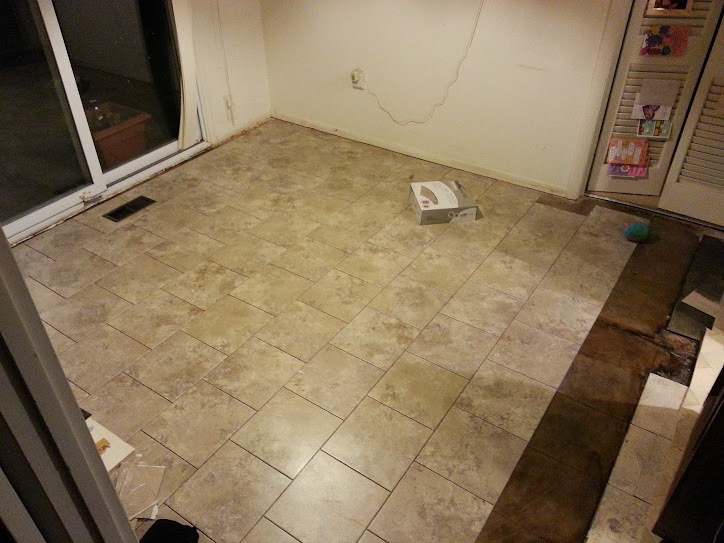 The tiling is done, and all of the tiles are also grouted! 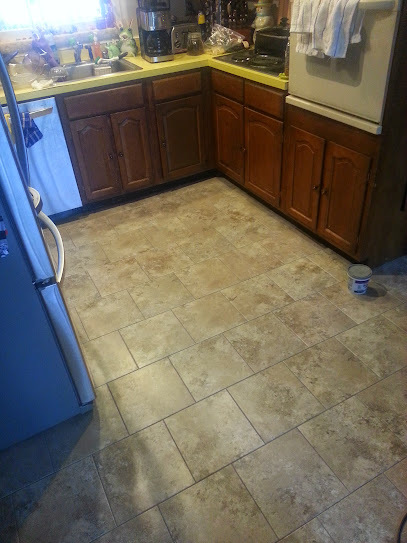 I used sanded grout with color pre-mixed in. It looks great! 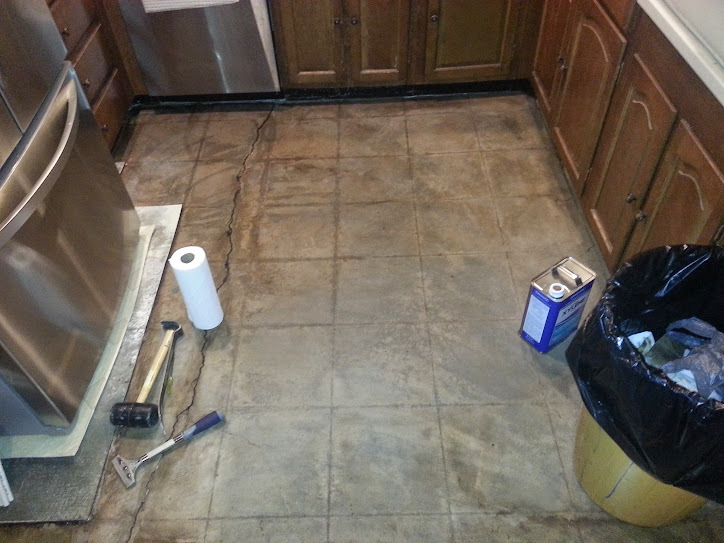 Pro tip: when you're doing the grout, pack in around five or six tiles, then use a wet sponge to clean the excess. Doing more at once means it'll take more effort to clean off the excess, it'll flash dry and take more time to remove. After the grout had set for a full day, I used a grout sealer - they make one in an aerosol can that's super easy to apply and works really well! This will keep the grout from getting dirty and needing to be replaced every few years. All original material on this page is Copyright 2015 Brad Jelinski.